Ravenswood Queensland is an interesting outback town. 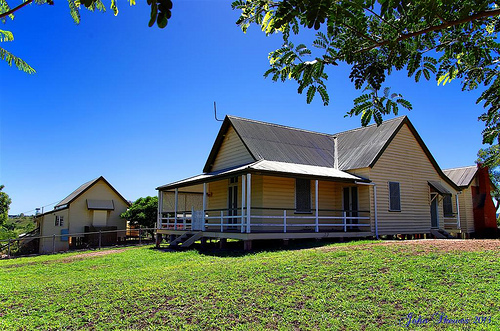 The little Ravenswood between Townsville and Charters Towers has been an on and off mining town for the last one and a half centuries. There is a whole lot of interesting mining history, as well as a working gold mine. 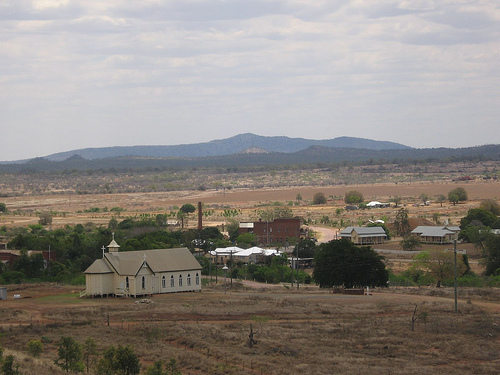 The first rush started in 1868 when local pastoralists found gold, and the first crushings were very rich but the success of the mine was over by 1872. In 1893, the mine manager A. L. Wilson managed to convince British investors to the mine. They used new processing methods that proved incredibly successful. Ravenswood’s population grew to 5000 and boasted over 50 pubs! After producing about 12½ tonnes of gold, the rush was over again in 1917. There is an old miner’s cottage at the entrance of the town. It’s hard to imagine how the owner John Stuffard lived here with his wife and 10 kids. The rooms are dark and tiny, the floor is bare earth, the ceilings and doorways are so low that anyone taller than five feet could not stand straight inside the house. Outback winters are freezing cold, the shower is outside, and the corrugated iron walls stand up without a nail in them. Nothing but a lot of gold would get anyone to live in these conditions. Today, the mining is back in Ravenswood. With new methods producing gold is viable again and so in 1987, 1994 and 2000, new mines opened. But today’s miners fly in and out so this hasn’t changed the town’s population of 100. 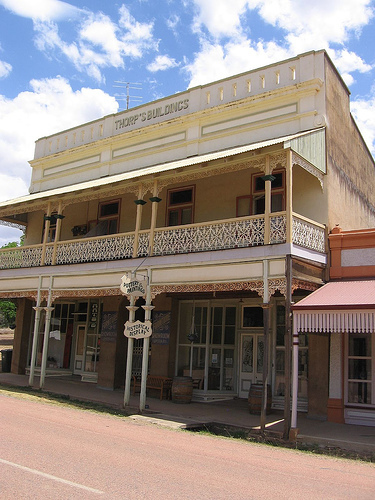 Other things to see in town are the Courthouse Museum in Macrossan street, St Patrick’s Church, a school, an old railway station, a cemetery, an old post office, the ruins of the Marble Mill, and six chimney stacks from the old mining days. Two historical pubs remain, both with a nice old bar, and hotel rooms upstairs. 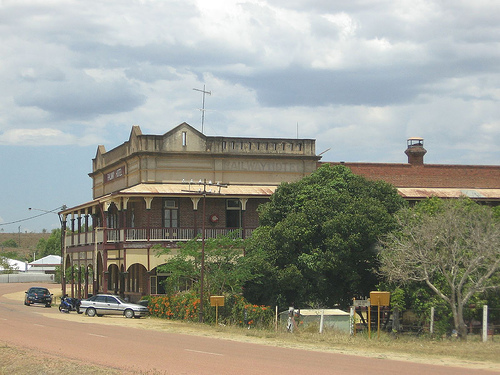 Imperial Hotel is most impressive but is said to be haunted and gets noisy during the weekend nights, so if you prefer to be left alone, try Railway Hotel instead. There is also a caravan park and a camping ground in town if you prefer camping. Here's a map of Ravenswood Australia - you can double-click anywhere on the map to zoom it in and see the places closer. Drag the map to move around, and if you want to see the satellite image with Google Earth, click on "Sat" in the top right hand corner.